Wait, there are albino Smurfs now? The very first image from the sequel to The Smurfs is out. You have now acquired this information. And are these...albino Smurfs? The girl is called Vexy, and will be voiced by Christina Ricci. The boy is voiced by J.B. Smoove, and his character name is Hackus. These beings were created by Gargamel and his terrible CG-faced cat. Their official species name is The Naughties. Sure, why not. 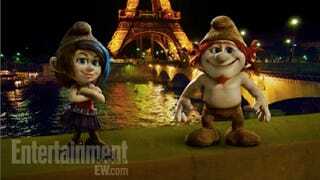 According to Entertainment Weekly they're going to cause a lot of trouble for the Smurfs in the sequel. What's happening with Gargamel these days? The villain has been stranded in the real world and got a gig as an entertainer in Paris. His big bad plan is to use the Eiffel Tower as a conductor to get himself back home, but he needs more Smurf magic first. This is inarguably a movie that is being made.